﻿ The boss Aristide Lucas"
The " Patron Aristide Lucas "
Yes, the " Patron Aristide Lucas " is a great rescue ship. 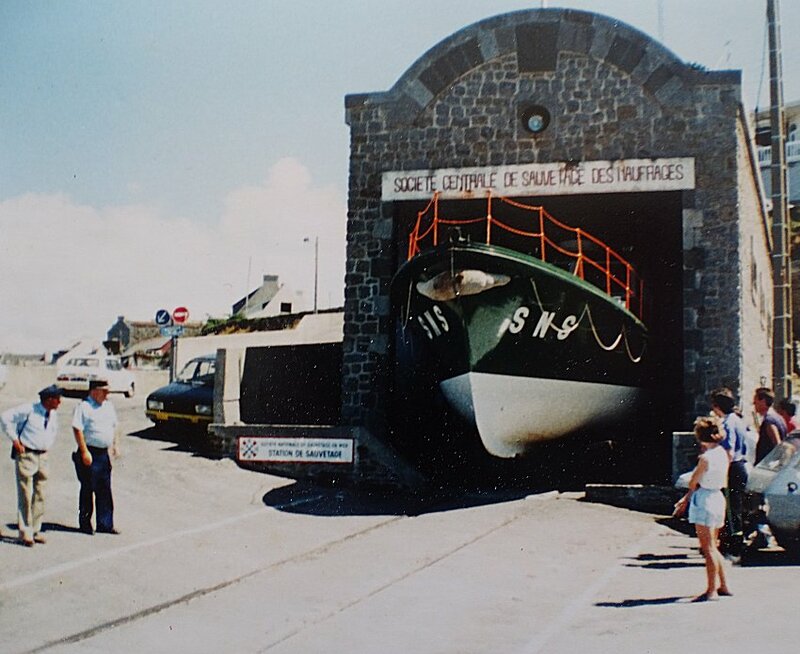 A mythical boat which was for 34 years based in Le Conquet and which today sits in Plouarzel in front of the entrance of the CROSS Corsen, the Regional Operational Centre for Surveillance and Rescue, of which it has naturally become the emblem. The Iroise Country borders one of the most dangerous maritime areas on the planet : strong currents, strong winds generating frequent storms, numerous reefs and, to complicate matters, one of the most important maritime traffic in the world. In these extreme conditions, rescue operations have always been a priority for the population and coastal ports have had to adapt and endow themselves with ever more efficient equipment. Access:	Leave the village of Plouarzel by the road of Le Conquet and at the roundabout take the direction of Trézien whose lighthouse can be seen on the right, 3.4 km further on. After passing the lighthouse, take the 2ndroad to the left. At the end, turn right, then right again. Park near the boat. 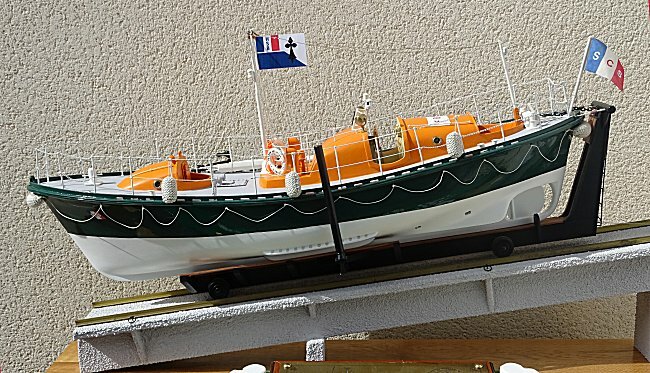 The details given in french on this panel placed in front of the boat are only a very small summary of its characteristics as well as its many sea rescues that have made its reputation. 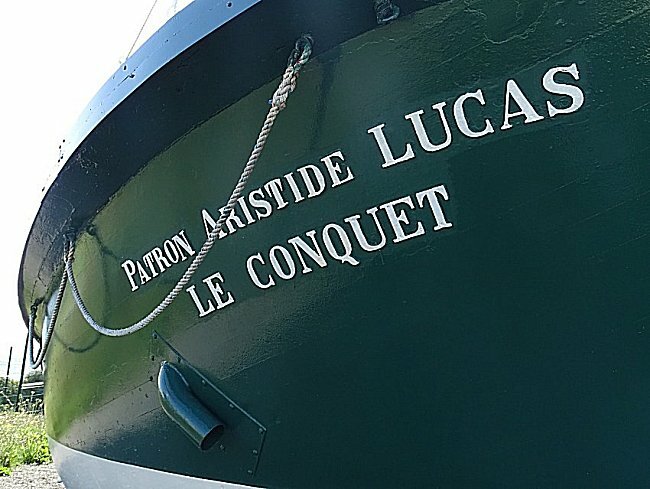 The historian of the Le Conquet Jean-Pierre CLOCHON has dedicated a page of his blog about this boat ( "Patron Aristide Lucas" ). 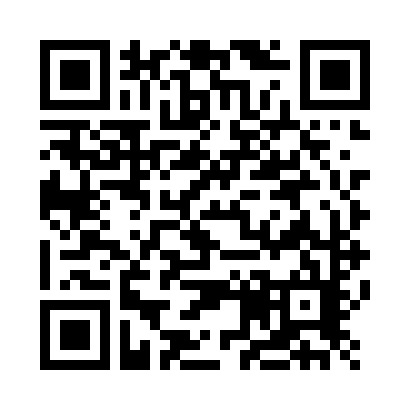 This page, written by one of the ship's former seamen, is richly illustrated, very detailed and is worth your visit. The boat was ultra-modern at the time. Its essential parts such as the stem and keel are made of oak. The ribs are made in bent acacia. The teak deck from Burma. 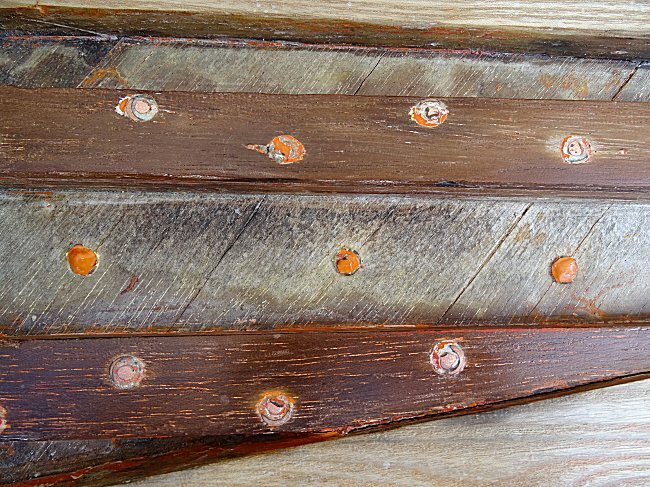 The hull is made of solid mahogany Bassam slats from Ivory Coast, crossed, forming three superposed folds and riveted with copper every 4 or 5 cm. Behind the hull, 112 copper boxes provided an air supply of 11670 litres in six watertight compartments. 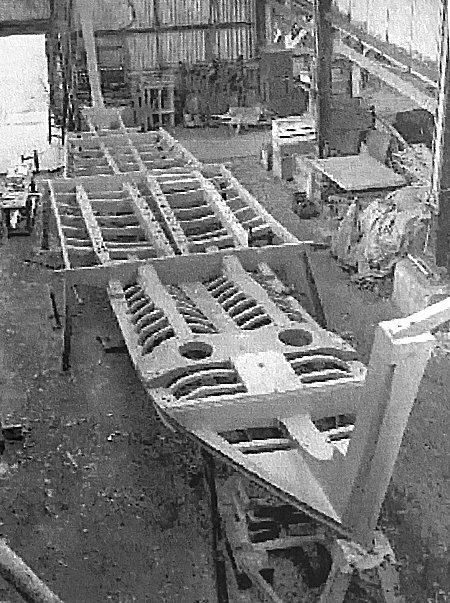 In addition, a 2.5-tonne cast iron ballast, bolted to the keel, made the ship self-righting. During her long years of active service, she underwent several modifications : her cabin was enlarged twice and her painting evolved. accompanied by all fishing boats. Placed on a large cart secured to a powerful winch, she would come out of her shelter and ran down the slipway on rails to plunge her nose into the ocean. A huge cloud of foam was then splashing the ship and the two motors tore the boat from the quiet port while the cart waited for her to return on the slipway. Despite her respectable age, after 34 years of service, the " Patron Aristide Lucas " shows that she is always carefully maintained. An agreement provides that this essential work is entrusted to the descendants of Aristide Lucas, with the municipality of Plouarzel providing paint and equipment, while the CROSS Corsen provides logistical support. 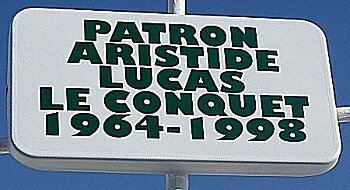 A street of the Conquet also bears the name of Aristide Lucas. But who was Aristide Lucas? We went to visit the current descendants of this local figure who has left such a lasting impression on the collective memory. They are the Aristide's great-grandchildren Jean-Pierre, Thierry, Martial and Josse LUCAS, who maintain the boat. Aristide Lucas was born on the island of Sein in 1888. He was part of the third generation of fishermen from Paimpolaise origin who had settled in Le Conquet. When he was fisherman aboard his sloop, the General Joffre, he became famous on March 25, 1922 by spotting at dawn the wreck of the English steamer City of Frankfurt, which, in bad weather, ran aground, in the middle of the night, on Chaussée des Pierres Noires, off Point St-Mathieu. It was a 522-ton cargo ship delivering 12,000 tonnes of coal to Brest. The sea was still very bad and the small sailboat of Aristide had a hard time docking the ship skewered in the reefs. The manoeuvre even sprang a leak to his boat. Despite the risks, Aristide Lucas and his two sailors rescued the captain, the mechanic's assistant and a six-month-old baby. They dropped them off at Le Conquet shortly after 8 a.m. when the Vaillante gunboat and the National Navy tug Haleur were just intervening to recover the other 11 occupants of the cargo ship. The captain's wife, the mechanic and one of the crew members who had left the cargo ship in a lifeboat were never found. 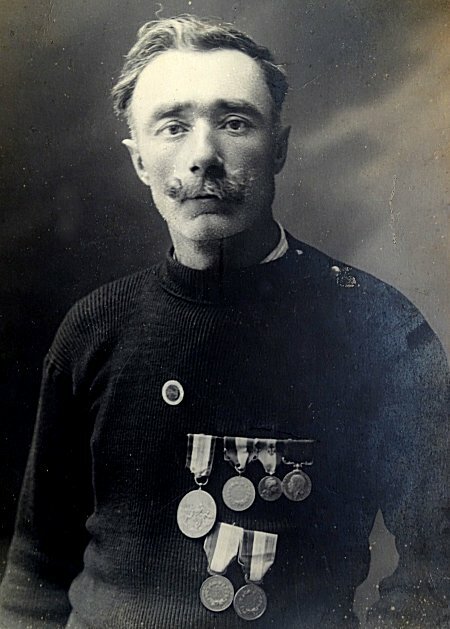 His courageous action earned the fisherman the admiration of all, and the following year he received two medals, one French and the other British, from hands of Admiral Guépratte. He was already part of the crew of " Lieutenant Pierre Geruzez ", the Le Conquet's salvage ship. Shortly thereafter, he replaced Boss Pierre Le Goaster as the head of the rescue station. 1. Aristide Lucas and his crew of volunteer fishermen participated in a very large number of rescues, at least 350, and he obtained, among other things, the Legion of Honor. It is still said in Le Conquet that one day in April 1937, as he was going to his daughter's wedding, hunched up in his new clothes, he had suddenly to leave there guests and ceremony. 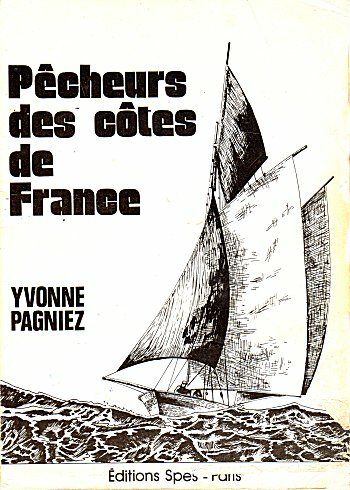 He came out of her shelter the great salvage ship that he commanded at that time, and, despite the heavy rain, he rushed into the gusts towards the cove of Blancs Sablons where the " Notre-Dame de la Vallée ", a fishing boat that had become ungovernable, and was about crushing against the rocks. 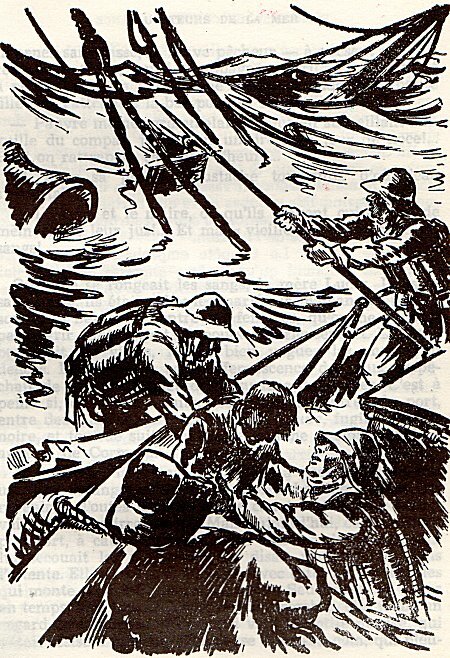 The crew of the salvage ship, unharmed but exhausted, brought back the three fishermen to port, with as a bonus and despite the storm, their intact sailboat taken in tow. And an hour later, it was a proud bride-to-be in her beautiful white chiffon dress who entered the church to her father's arm. He was dressed in his everyday clothes... but dry. This great figure of Le Conquet died of pneumonia in 1940, at the age of 52. He had caught a cold after three successive rescues on the same day. A huge crowd paid tribute to him. 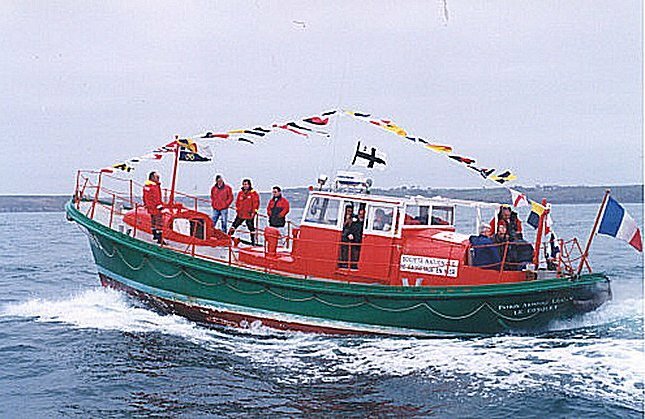 Twenty-four years later, the rescue station decided to name its brand new self-righting and unsinkable salvage ship Patron Aristide Lucas, which was only retired and put in front of the Corsen CROSS in 1998. 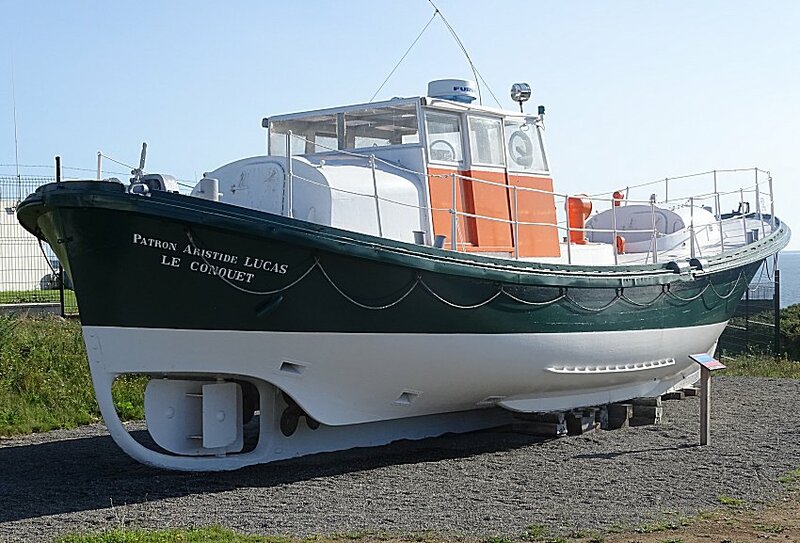 Such a boat, so well preserved and with a name full of memories, emblematic of the resorts of Le Conquet, Molène, Lanildut and Portsall, is it not a beautiful part of our maritime heritage ? -1- SCSN: In french Société Centrale de Sauvetage des Naufragés. It is still the name written on the old shelter of the Conquet rescue ship. This association, created in 1865, merged in 1967 with the Société des Hospitaliers Sauveteurs Bretons (HSB), founded in 1873. The new association took the name of SNSM, Société Nationale de Sauvetage en Mer. 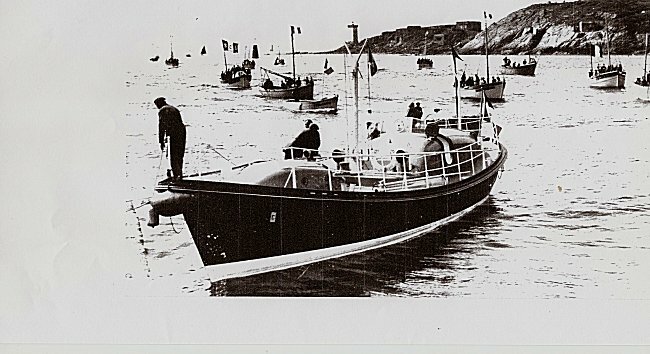 Today, the SNSM is based in 218 stations throughout the metropolitan and overseas coasts, such as Le Conquet, Lanildut, Portsall and Ile Molène. 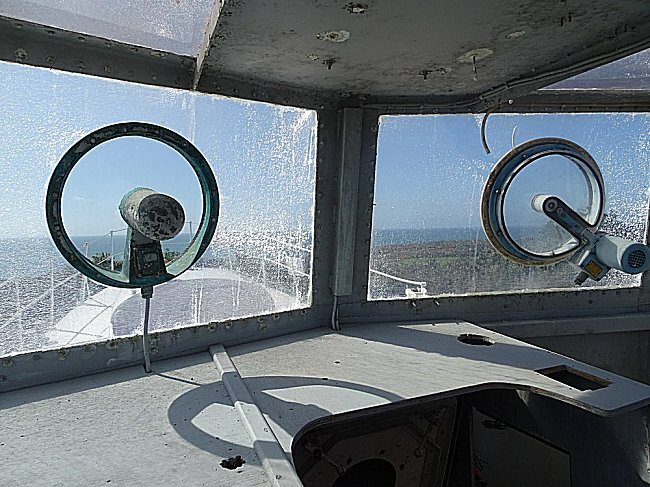 It operates at the request of the CROSS, of which the CROSS Corsen is one of the most important since it manages all international maritime traffic off Brittany. Thanks to the Lucas family for providing documents and to CROSS Corsen for their support in the creation of this page.